If you&apos;ve ever wondered what a car-free Los Angeles might look like, you could soon get your answer. Sunday, April 10, 2011 marks the second annual CicLAvia, an event during which streets are blocked off to cars so that bikes, runners, walkers and all others (except...well...drivers) can get out and enjoy the sunshine safely. While you&apos;re en route, Huffington Post has a list of historic buildings to look out for, including the 4th Street Bridge, the Japanese American National Museum and El Dorado, the former Stowell Hotel. 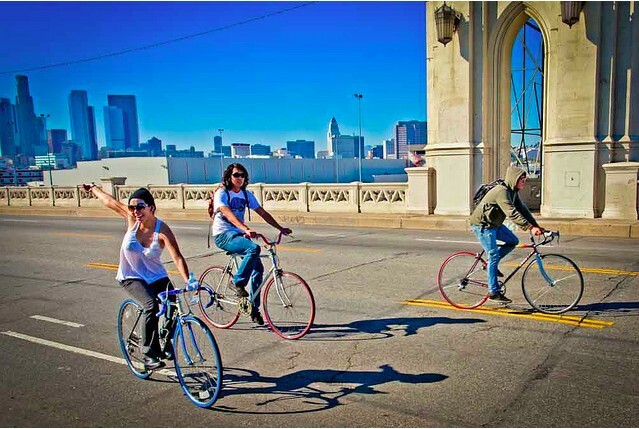 The name CicLAvia is a spinoff on the word ciclovía, which in Spanish literally means "bike path," but is used to describe a tradition that originated in Botoga, Colombia in the 1970s. Faced with congestion and traffic problems, the South American city adopted the idea of regularly closing down streets to traffic, according to StreetsWiki. The idea took off in the 1980s, and now, the city holds ciclovía every Sunday and holiday, between 7:00 am and 2:00 pm. Last year&apos;s event in Los Angeles closed down 7.5 miles of streets, and this year&apos;s event will follow the same route between Hollenbeck Park and the intersection of Melrose and Vermont, according to CicLAvia&apos;s website.